Ashley at A Hasty Life hosts this little gathering (basically me and her!) of folks who have determined that what we wear has lent itself into our memories, much the same way people attach themselves to music or food. This week I am going to discuss this little number I wore in 1975. I made this dress with fabric from Murray's, one of those delightful small town stores that sold clothes, shoes, linens and many other delights, including fabric. I had purchased the pattern somewhere and decided that I wanted to make my dress to the Winter Dance. The fabric is a knit with a knobby feel. It was rather clingy and felt good on my skin. 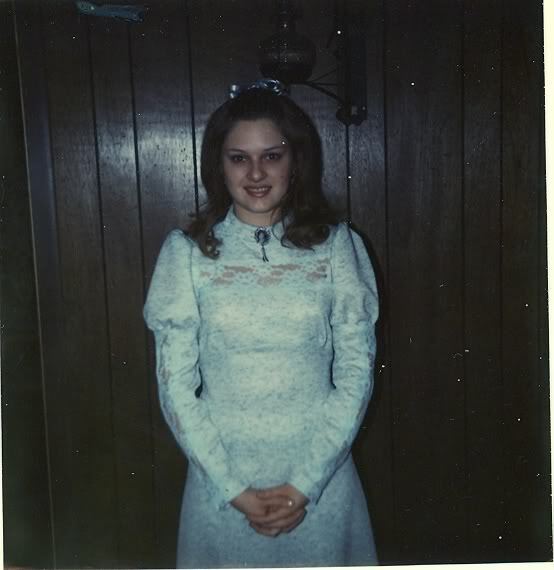 I made the dress with help from my High School home ec teacher, Cindy Hoover. I remember having some trouble with the sleeves, getting them just right! I remember being very proud of my creation! I remember thinking I didn't feel like I had on a homemade dress. I can recall thinking I was like a designer wearing her own creation to the ball. That's a wonderful dress and a great accomplishment! and you are so cute, the belle of the ball! It's a beautiful dress and you did a wonderful job, Terri! The pattern is very similar to one I used for a dress for my daughter when she was part of the court at a fall festival at school. I remember those sleeves well. She was in 1st grade. I made many of the girls' clothes when they were young, but gave up sewing long before the g'kids started coming along. Beautiful dress; gorgeous gal! What a cutie pie! My first thought was that you looked like the perfect Juliette. Beautiful! I love this post!! What a wonderful memory with a photo too!!! Beautiful!